The Cessna Citation Excel is a straight wing Citation capable of seating 8-10 passengers comfortably in a roomy stand up cabin. The excel was designed with a shortened citation X fuselage, the tail and wing of a Citation V and powered by two and Pratt and Whitney 545A turbofan engines that produce 3,804 lbs of thrust each. The blending of prior successful Citations make this a very impressive jet. It can depart short runways and climb straight to 43,00 feet. It normally cruises at 420 knots and has a 1,850 nm range. 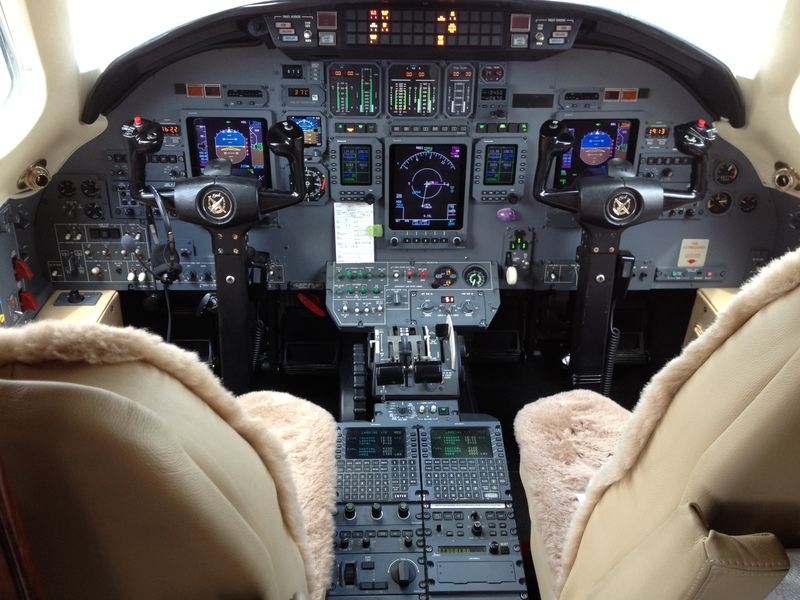 The Avionics in the instrument panel pictured here are the Honeywell Primus 1000 integrated digital avionics three screen EFIS system with dual radio control units and two Universal 1C FMS Systems. 30 minutes of emergency attitude display is provided by a Megitt AMLCD backup attitude indicator. This entry was posted in Cessna Citation and tagged aviation pics aviation images, avionics, ce-560xl, cessna, cessna 560xl, cessna citation, citation, citation excel, citation xl, cockpit, cockpit image, excel, glass cockpit, honeywell primus 1000 on August 24, 2012 by James Sorsby.